Who is Harold? Well, if you haven’t yet met him, you can be properly introduced to him here . This post, however, will be devoted mostly to his archenemy, and no, it’s not my husband! Harold’s rival is a sweet, 91 year-old, blonde beauty, a social butterfly, champion paddle-boarder, creek swimmer, island-explorer (maybe blondes really do have more fun), and self-appointed greeter of all who happen to pass by while she’s out and about in the neighborhood. She loves to take walks, then cool off in the creek on especially hot days-she has even been known to mud-bathe when the tide is out. She bears the title of royalty, though she’s quite down to earth…she is, none other than, Princess-our lovable, happy, Harold-hating shepherd. We got Princess from my sister, who very sweetly took on a male shepherd, his mate, and eleven puppies to find homes for. We already had a dog, Noah, but he was getting up there in years. The kids were young, so I thought it was a good time to get a puppy they could grow up with and I would have as company when the “empty nest” years hit. Princess was the runt of the bunch. The original owners of the shepherd family said she had to be resuscitated after she was born, so I think she became a favorite, and it is they who gave her the name, Princess. When we first brought her home as a pup, I remember her being afraid of the dark, and especially a full moon. However, after her dad came to join us, which is another story, he became her idol and she soon braved-up facing the dark and the moon like a champ! I’ve loved many dogs over my life, each special in their own way, but never a dog with a sweeter disposition than our dear Princess. So why her intense hatred of Harold? We really don’t know. Why he hates her, is quite obvious! 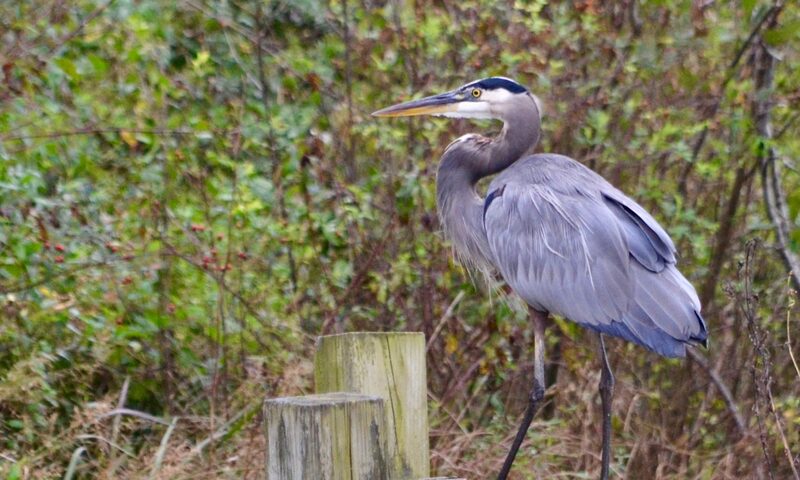 He is a grouchy loner after all, but more than that, he loves to hunt in our “backyard.” He will occasionally stroll through on his way to his next hunting spot or stand just off-shore at low tide. Upon spotting him, Princess goes into an exceptionally venomous barking rant and runs down to give this foe a piece of her mind. At this point, anything Harold had been eyeing for breakfast, lunch, or diner has just swum off, and off goes Harold as well, screaming angrily as he does. I’ve often thought it’s a really good thing we can’t understand Harold’s language! Princess trots back, happily satisfied that she has once again laid down the law to Harold and, once again, is ruler of all she surveys. Time for a rest, until the next Harold intrusion. So now you know all about Princess, our faithful friend and Harold’s faithful nemesis!